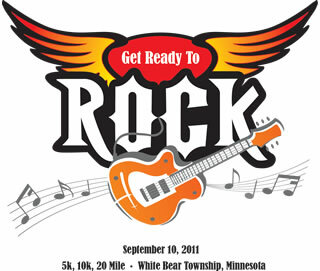 On Saturday, September 10th, I ran the Get Ready to Rock 5k inWhite Bear Lake. I’ve been meaning to do a recap since I ran it, but to be honest, it was a very uneventful run and there wasn’t much about the run itself that stuck out. This was the first run, however, that my mom accompanied me to, other than Warrior Dash. I typically go to my races alone, but my mom wanted to go with me to this particular one, which was a nice change. It was probably a good thing that I did the 5k and not the 10k, though, because she would have been waiting a lot longer had I done the 10k. Anyway, I started the morning with a whole wheat bagel thin with swiss cheese and deli ham. Protein plus carbs always makes me run better. Since packet pickup was the previous evening, there wasn’t any need to show up extra early. We arrived at the race location only about ten minutes before the start. We were there to send off those running the 20 miler…those people amaze me! The first mile of the race went by very quickly. From looking at the map beforehand (I think REAL runners probably do this for every race) for once, I knew at all times approximately where I was in the course. The second mile was one long, straight stretch before turning and heading along the lake. Even after the second mile, I felt really good physically and my mind was actually in this run, unlike the last one I did. As usual, there was one runner (it’s always a female!) who would speed up and slow down continually alongside me. I’d pass her when she slowed to walk and then she’d pass me again at a run, only to slow down to a walk directly in front of me. Do these people do this on purpose or are they just completely oblivious to their surroundings? I’d love to know! Somewhere along the third mile, I blew past the water station, knowing there was less than a mile left. This is where I finally lost the annoying girl for the remainder of the race. By looking at my watch, I knew I wouldn’t be meeting my fastest 5k time, but I think feeling really good during the run is just as important if not more important, so I didn’t push myself any harder. I wanted to finish strong. My mom was at the finishing line, snapping pictures as I came across. My finishing time was 33:14, so not terrible but not my best. I’d still love to get a sub 32 this year, though.